Demand in San Diego for Burial at Sea – Ash Scattering at Sea – is increasing as more families become aware of this wonderful way of releasing the earthly remains of their loved one. It is a moving celebration of life which takes place at sea to honor the deceased family member. Southern California is the perfect place for such a ceremony given our ideal year round climate. Our funeral home “Funerals Your Way” was founded as a result of performing ash scattering – sea burial – for many years. We realized that families were paying too much for cremation services. We offer great pricing on cremation with and without services. Knowing we could do better we began offering families “One Point of Contact” for both their cremation and ash scattering at sea needs. Families are going through a great deal of grief with a loved one passing and having one person to make arrangements with is easier for them. You may even pre-plan and pre-pay for these services far ahead of need. This is a great idea to make it easier for your family. With each ash scattering burial at sea, we provide the family with a Memorial Certificate as a remembrance of the event. It specifies the latitude and longitude of the scattering location as well as the deceased name, time of ash scattering and water depth. Many families find this useful as it allows them to return to the exact position for a remembrance trip to scatter additional family members who have passed. As well, we generally provide you pictures of the days events in order to share memories with your family and guests. Both for those on the yacht and others that could not attend. As well, we generally provide you pictures of the days events in order to share memories with your family. Both for those on the yacht and others that could not attend. A Memorial Card with of the loved one and a link to pictures from the sea burial event. We go where ever you would like to go for a scattering at sea and service multiple cities up and down the coast of California. If in the San Diego area, our usual location is just south of Point Loma with Hotel Del and downtown San Diego in the background. However, we can go wherever you like. Commonly serviced locations are Ocean Beach, Mission Bay, La Jolla and Del Mar. If you are other than in the San Diego we can still help. Funerals Your Way has associates in many communities along the coast and will be able to arrange an ash scattering at sea – burial at sea – for you. A family typically select one of the following methods to scatter their loved ones at sea. The choice depends on many factors number of relatives, does relative want to be on a yacht and cost considerations. By far the greatest number of ash scattering we do (over 90%) is attended, meaning that the family is on the yacht and participating in the event. For these type of services, we always have a facilitator on the yacht to help the family with preparation of cremains, readings, flowers etc. We do their best to ensure that you have as pleasant a charter as possible. Excellent customer service is important.. If you are planning an unattended scattering you will need to drop off the cremains at our office or mail them. If you do not have a disposition permit for scattering at sea you are going to require one of these. Having the family present on the yacht is our most typical type of ash scattering trip. It provides the family with a wonderful opportunity to say goodbye articipate in the scattering, giving tremendous opportunity for closure and bonding. Many families combine this with a sightseeing charter, allowing all present to socialize taking advantage of the gathering. Catering and a full bar is available. Occasionally, the family cannot attend the scattering. In these cases, we preform the ash scattering at sea on their behalf and show the same dignity and respect for the loved one as if they were there. We can take pictures or a short video of the event if desired. As with will all our ash scattering – burial at sea – services, a memorial certificate is emailed to the family within a few days of the scattering. Shore viewings are requested when the family does wish to observe the ash scattering, but do not wish to be on the yacht. On some occasions a few family members are on shore and a few are on the yacht. Often these take place with family members watching from a pier. Favorite locations are Ocean Beach Pier, Crystal Pier or from special beach locations off La Jolla, Del Mar or Cabrillo Monument on Point Loma. There are many ways of scattering ashes at sea. Our two most popular are described below, however it is possible to scatter ashes at sea directly from the standard plastic cremation container. We do not generally recommend this because of “blowback”. The yacht crew will work with you to minimize this should you decide to use this method. Our most commonly used method of scattering is to intermix the cremains in a basket or urn and lower to the ocean’s surface. The urn is then inverted and the ashes disperse leaving the rose petals floating in the ocean current. 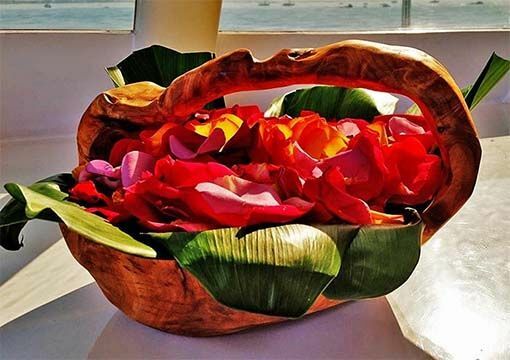 It creates a beautiful presentation especially when additional flowers, a wreath or leis are placed in the water as well. We feel it is important for all present to have a least a rose to place in the ocean. This allows them to feel included and important for the event. For some families, the use of a biodegradable urn is desired. Made from a variety of products such as paper, salt or sand, they are a nice addition to the sea ash scattering ceremony. The Biodegradable Turtle (shown above) is a favorite and commonly selected by families. We however have a huge variety available. The biodegradable urns made from paper products float for a few minutes and then gently sink beneath the waves. Because we so believe in burial at sea and the scattering of cremains in the ocean, we have a whole separate company established that specializes in just that. San Diego Burial at Sea is San Diego’s leading company which performs such a service and over the years have refined the procedure, so each family has a beautiful healing experience on our yachts. Have a look at our photo gallery of sea burial pictures.